Remember the curious tale of the Nokia Moonraker- the Windows Phone smartwatch that was cancelled in 2014? It was the smartwatch that was cancelled due to the existence of the Microsoft Band, another wearable that Microsoft is seemingly abandoning. After more Moonraker photos surfaced this year, the folks at Nokibar have got their hands on a video giving us our best look at the ditched smartwatch. As you can see from the video, the Moonraker looks a bit like those first generation Samsung and LG Android Wear watches with s pretty basic rectangular design. Swiping up and down on the touchscreen display shows some pretty standard smartwatch features like checking in on messages and notifications. It also supported fitness tracking features, a find my phone mode and two physical buttons above and below the screen. Discovered by leak master Evan Blass, the Nokia Moonraker smartwatch was apparently in a prototype stage when it was shown off at MWC 2014 in Barcelona. The plan was to launch it alongside the Lumia 930 smartphone. However, Microsoft bought out Nokia and pulled the plug on the Windows-esque smartwatch, in order to focus wearable attention on the Microsoft Band activity tracker. The Moonraker smartwatch would have packed in calendar update, emails, texts, step counting, a camera remote control, Nokia's Mix Radio app and third party notifications from the likes of Facebook. These images, taken from a Microsoft design employee's Tumblr, were said to be potential marketing images, rather than just concept designs. Earlier this year in January, these unflattering images below turned up on Chinese social media site Weibo. They show the square display of the Lumia-esque smartwatch, complete with charging pins on the back. Serial leakster Evan Blass, he of many (later confirmed) rumours then shared a "bonus" GIF of the smartwatch, here in the bright green model. It didn't tell us anything new, though Ubergizmo pointed out there's no heart rate monitor. 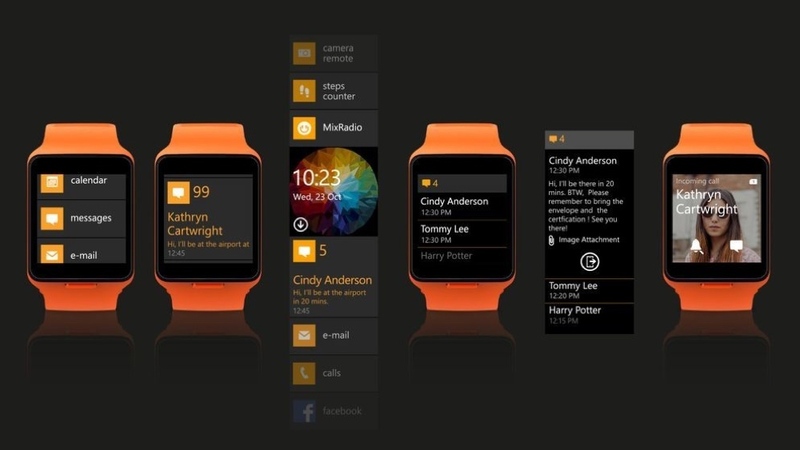 The Nokia smartwatch dream might not yet be over, however. As part of a restructuring of the company, Nokia plans to amend its Articles of Association to include "mobile devices and consumer wearables and other electronics." Additional rumours suggested that Nokia (even after the acquisition) was working on a wearable prototype technology based on the company's Kinect and Morph research. So it's possible that Nokia already has something in the pipeline.